Today I have some crazy awesome nails to show you! This is for my next challenge in the Chrysler Ypsilon & Stylist Vice or Virtue Challenges! If you missed my first challenge post make sure you check it out. You can also read all about what Chrysler are up to and join in the fun! Everyone is welcome to take part, so make sure you check out the challenges yourself! – I’d love to hear if you do any of them! Chrysler have planned this fantastic campaign for their Ypsilon stylish 5-door city car. For those that don’t know – Ypsilon is actually the greek letter Y. The story goes that the trunk of the letter Y represents our youth and as we reach adulthood we make the choice of taking the path of either vice or virtue… and this is where the idea of the challenges originated from! Research by Chrysler Ypsilon has found that a number of us would love to take the route of vice, but life pressures and fears of what others may think is preventing us from being more daring. Chrysler Ypsilon has partnered with Stylist.co.uk to launch the Vice vs Virtue campaign to encourage women to step out of their daily routine and Dare to be different! So this challenge was to go to a nail bar and choose a crazy design to celebrate summer. This is totally up my street, you’ve probably noticed I’m a big fan of bright colours, the louder the better! I booked my last minute (ahem) appointment and arrived at my local salon. The beauty therapist asked what I was looking for? I asked her to make my nails as bright as possible – go crazy I said! Do whatever you like! She looked at me with a raised eyebrow like I was some sort of crazy person. (Me? As if!… I also happened to be wearing a neon yellow top, with a neon orange kimono – I’m hoping she was thinking I was eccentric rather than just nuts!) She seemed a bit apprehensive so I assured her whatever she did would be fine, and to take it as an opportunity to experiment! Maybe use my bright clothing as inspiration!? And this is what I ended up with! The most amazing neon pink nails, with bright yellow accent nails on the ring fingers, and neon stud details on my thumbs and ring fingers! The picture really doesn’t convey the intense brightness of these colours, the pink especially. 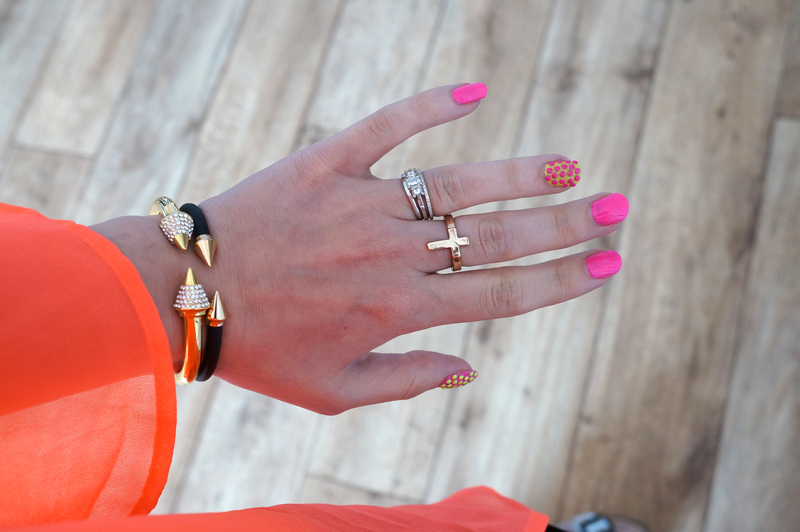 With the combo of these nails and my outfit, you’d definitely need sunglasses to look at me! I’ve included a shot of my full outfit, just so you can see how crazy bright I looked! I love it!! All I need now is a tan, a cocktail – and a holiday in a hot destination! !